Well, what can I say? Yesterday was a day of mixed emotions when the winers of The Great Outdoor Magazine Readers Awards 2017 were announced and needless to say as you can tell form the post heading, I WON! Honoured, proud and not to say somewhat surprised to say the least. To have The Wainwrights in Colour recognised in such a way after such a long and testing time is still hard to believe. I recall that at the official book launch back in May in Kendal that the whole thing felt like an “out of body” experience- had I actually completed this mammoth task? was this really my book that people were lining up to buy? It was almost the same feeling on Thursday evening when a friend on Facebook gave me first notice that I had won. The results were not meant to be published until yesterday (Friday) but due to her subscription copy arriving early she couldn’t wait to let me know. However, I only really believed it when I bought my copy of the magazine yesterday and read it for myself. Being shortlisted was an honour in itself especailly when I saw the other books on the list such as Steve Birkinshaw’s book No Map in Hell which relates his experiences in setting a record time to run over the 214 Wainwright Fells- the same fells that are featured in my book. Also Geoff Allan’s book The Scottish Bothy Bible which I understand sold something in the region of 7500 copies in the first print run. How was I ever going to compete with volumes such as these? In fact at one time I was quite disheartened about the whole thing and questioned my own reasoning for not making The Wainwrights in Colour available to the mass customer base that purchases books through the Amazon store. My principle of just making my book available through either my own website or from high street bookshops could have been my downfall. Perhaps if I had offered the book to online retailers the 5000 edition would have sold out some months ago, even if some of the sales had been at a discounted rate. So yesterday as I was making another delivery of books to shops in the south Lakeland area I had time to consider why my book should have won this prestigious award. It cannot be on volume of sales so I can only assume that it is partly down to the excellent publicty that I have had over the past years that has worked in my favour. From local and regional press right up to the BBC the idea obviously caught people’s attention. Even TGO magazine earlier in the year featured me in a four page article which may have influenced some of their readers to vote for me. In addition, I have always been aware of how social media such as Facebook can work for businesses such as mine so I use it to the best of my abilty but I understand that it is a two way street. It is fine for artists, authors and photographers to use this medium to make users aware of their products but personally I like to interact with others and not just post for the adoration and likes. By doing so I have built up a network of friends, some I know personally and some are online but all of them will be aware of what I do so when it comes down to a request for votes in awards such as this perhaps that all worked in my favour. I would like to think though that many votes came from those who have been following my whole journey since 2006 either via my website, getting to know me through visits to the gallery in Barnard Castle or through other groups such as The Wainwright Society and its forum. So, here I am with this award and I am truly grateful to all of thse who voted for The Wainwrights in Colour. I have no idea if there is an actual glittering trophy to put on my mantlepice or even a formal awards ceremony but the honour is enough. Those people that know me though understand that this isn’t what The Wainwrights in Colour project was ever about. This has been a ten year personal challenge with the downs outweighing the highs. Only my ever-supporting wife Esther will fully comprehend the trials and tribulations of this whole undertaking and this award is for her too. If you are one of those who took time to vote, thank you. Contratulations to all the other winners in the other categories and to Steve and Geoff whose books were both highly commended. Meantime, it is back to shrink-wrapping books and shipping out orders in time for Christmas. Fantastic news! I told you it’s a winner and now everyone will know. Very well deserved Andy & Esther. Thank you Diane for your kind comment and support and patience throughout the whole project. 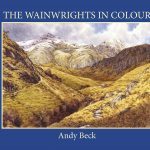 So very proud of what you have achieved Andy and I admire your dedication and passion to the wainwright’s in colour project. The end result is a stunning beautiful book, a must have for lovers of Lakeland and art. Thank you for your kind comment Marie. I was so overjoyed when I heard the news. I knew it would come in first place as there is no other book out there like it. This is a masterpiece. Other books on Wainwright may be published in the future, but nothing will come close to this as a work of art, love and dedication. Enjoy this fabulous moment Andy and Esther. Coming from such a dedicated Wainwright fan such as you Christopher that is indeed high praise, thank you. Congratulations Andy. We knew this project was something special from when we stumbled across it at Rheged. We had no idea how epic it would become for you, and are glad you a) had no idea either, and b) have the tenacity and family support to enable you to bring it to fulfillment. 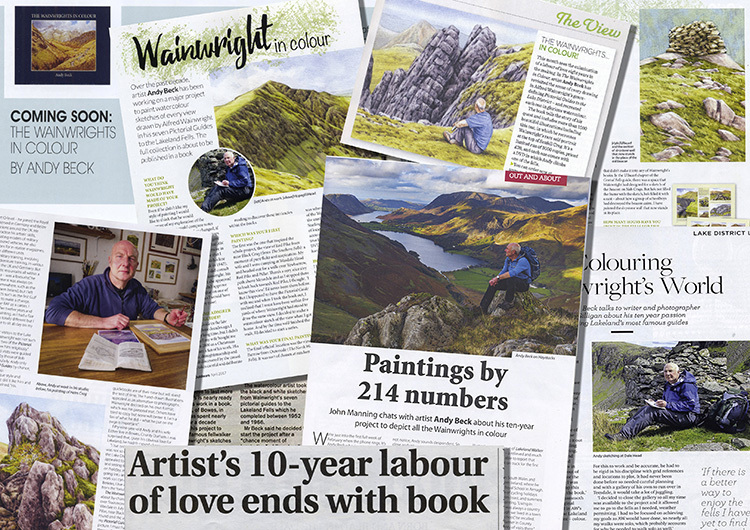 The awards and plaudits are fully deserved, and your determination to do this using local bookshops and mail order continues and honours the Wainwright legacy. Many thanks Nick for those kind words. Many congratulations Andy, I have followed your glittering career for some time and, quite frankly, I am not surprised that you are the recipient of such a prestigious award. Your dedication to the task over such a long period of time is a testament to your strength of character. As a completely unbiased observer, it would appear to me to be a result of your fine NornIron upbringing and the discipline of serving with the ‘Regiment’ … I promised myself that I would not make any reference to Gibraltar ..! Anyway, I am led to believe that Santa has a copy of your book that may be delivered, via a not-too-hot chimney, to this address … The lovely lady from the Hedgehog bookshop in Penrith was so enthusiastic about you and the book that she would certainly be a wonderful PR person for you ..! I am sure that you are inundated with messages of congratulations for your magnificent achievement. Thank you for the comments Colin.Yes, I think that the discipline that I gained from my service has helped in seeing the whole thing through. I am actually off to deliver more copies of the books to Hedgehog Bookshop this afternoon where the books have been selling rather well thanks to their enthusiasm.